The ankle ligaments are very commonly injured with sports participation. Ankle sprains make up the vast majority of sports injuries. From minor sprains to major instability, the ankle can be a problematic joint. 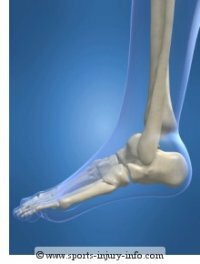 Understanding ankle anatomy, and specifically the ligaments will help you decipher that annoying ankle sprain, and figure out what exactly you have injured. 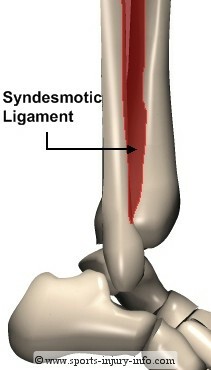 The lateral ankle is comprised of three different ligaments. In the picture on the right, the Anterior Talo-fibular Ligament is shown in red. This is the most commonly injured ligament. It runs between the talus and the fibula. 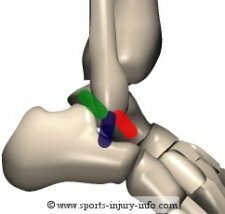 The Calcaneal Fibular Ligament is shown in blue. It runs between the fibula and the calcaneus. The Posterior Talo-fibular Ligament is shown in green and runs between the fibula and the posterior talus. The medial side of the ankle is comprised of one large ligament that spans the entire end of the tibia. This ligament runs between the tibia and the navicular and calcaneus. This ligament has several areas of thickening, or bands, but is considered one ligament. It is not commonly injured with ankle sprains, as the vast majority of sprains occur by rolling over the outside of the ankle. You may have heard of the dreaded "high ankle sprain". This type of injury involves the sydesmotic ligament, which runs between the tibia and the fibula above the ankle joint. This ligament is sprained when the fibula and the tibia are seperated or pushed apart. 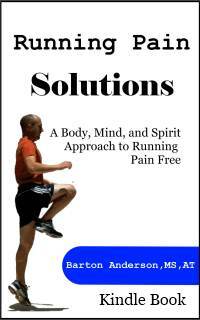 It can occur with forced dorsiflexion of the ankle, or with with a very forceful landing. The majority of ankle sprains do not involve this ligament, however, those that do can take an extra long time to heal because of the stress placed on this ligament during weight bearing activities. Ankle sprains involve injury to the ligaments of the ankle. The most commonly injured ligament is the Anterior Talo-Fibular ligament on the outside of the ankle. 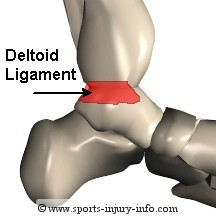 The larger, stronger medial deltoid ligament is less often injured.